Ever since I made these enchiladas, I have been extremely excited to post the recipe because I know you will love it! 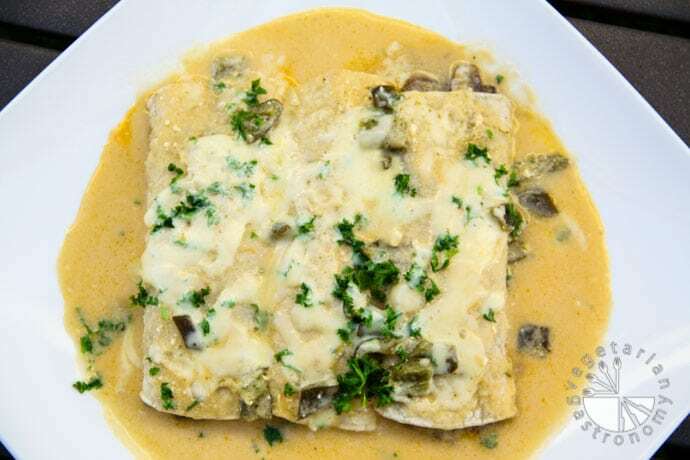 So finally here it is…Poblano Cream Sauce Enchiladas. Typically, in our home, our standard enchiladas are what I consider a quick meal because I can easily make them in 15 minutes (for those of you interested in this quick meal, I’ll post the recipe soon). These enchiladas take my standard enchiladas to the next level! 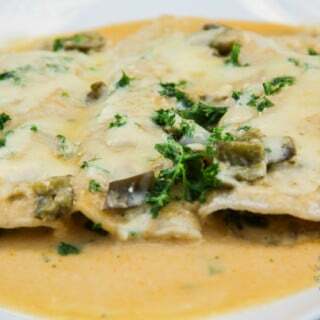 My husband and I had gone to a Mexican restaurant in Las Vegas and had Poblano Cream Sauce Enchiladas with mushrooms. They were absolutely amazing and I knew I had to recreate them at home. I originally searched through a bunch of recipes online and tried making a version of the dish by combining a few recipes, but the sauce did not turn out quite as creamy in taste and the flavor of the poblano chiles did not come across correctly. A few months later, a friend of mine mentioned she had made these Poblano Cream Sauce Cauliflower enchiladas for a dinner party. She passed along the recipe and I decided to give it a try with some modifications. This recipe was inspired by Sylvia from Feasting at Home. I adapted her recipe for the Poblano Cream Sauce, slightly reducing the amount of vegetable broth. I also decided to use some mushrooms, onions, and garlic in place of the cauliflower for the filling. We love mushrooms, so that’s my natural go-to when thinking of a vegetable, but in all honesty, you could probably fill these enchiladas with any other medley of roasted vegetables, or even something as simple as black beans and cheese. I also decided to use some greek yogurt instead of sour cream a few times and the resulting sauce was still delicious. 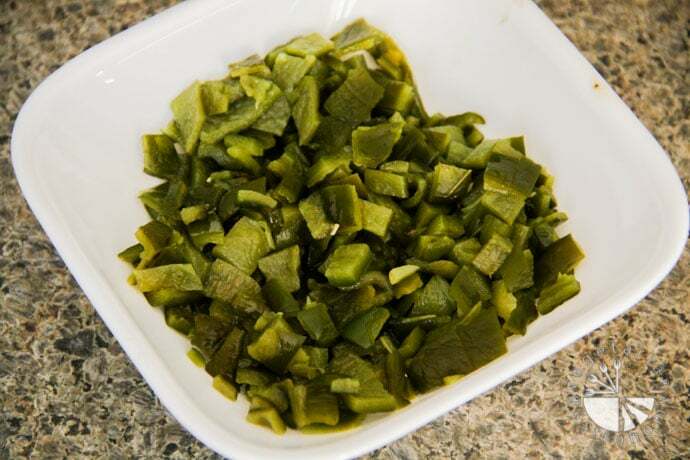 It was very easy and quick to roast the poblano chiles and prepare all the other components that go into this dish. Immediately after tasting the sauce and filling, I knew this recipe was a winner and that I was done searching for that perfect Poblano Cream Sauce Enchilada recipe! The flavor of the roasted poblano chiles came through perfectly, and the filling ingredients complemented the sauce very well! I made these enchiladas with a side of Cilantro Rice and black beans. If you have yet to make enchiladas in your own home or are looking for another variation of your traditional enchiladas, this recipe is impeccable and very easy to make! I would also love to hear what filling ingredients you come up with! Enjoy! 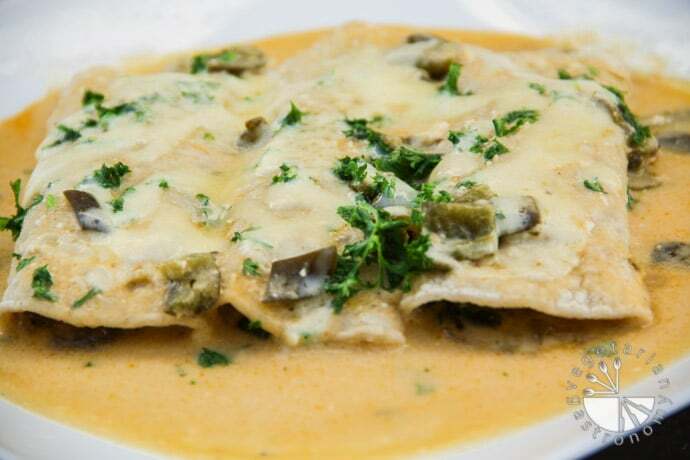 Roasted poblano peppers and mushrooms stuffed in corn tortilla and topped with a creamy flavorful poblano cream sauce! Line a baking sheet with foil. Lightly rub olive oil on the surface of each poblano chile. Place them on the baking sheet and bake for 10-15 minutes until the outer skin blackens and blisters throughout. You may need to rotate the poblano pepper half way through to even out the roasting. Remove them from the oven and place them in a bowl. Cover with a kitchen towel and set aside to cool completely. 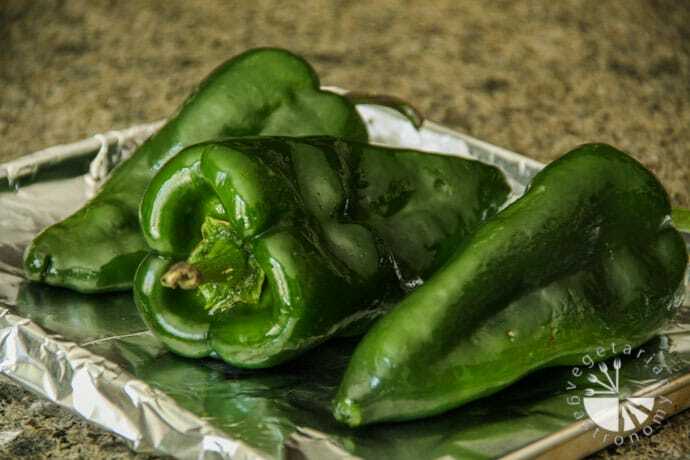 Once cooled, rub off the outer blackened skin under running water, carefully tearing the poblano chiles open and pulling out the seed pods and stems inside. Rinse all the seeds away. Finely dice the roasted chiles and set aside. In a non-stick pan, heat 2-3 Tbsp oil on medium-high heat. Add all the sliced mushrooms and diced onions. Saute until the onions are translucent, and the mushrooms are cooked/grilled through and all the water released from the mushrooms has evaporated. Half way through this process, add and mix in the minced garlic, some salt, and pepper. If the mixture starts to stick to the pan or starts burning before the veggies are cooked through, lower the heat or add some more oil. Set aside in a mixing bowl once they are done. Set the vegetable broth on the stove to heat up. In a medium sauce-pan, melt the butter over medium-low heat. Add the flour and combine with the butter. Let the mixture cook for about 5 minutes until it turns golden brown, whisking frequently. Next add 2 cups of sour cream (or yogurt) and whisk until smooth. Add half of the diced roasted poblano chiles into the sauce and bring to a low simmer. Adjust the salt if needed and add some freshly ground black pepper. Turn off the heat and set aside. To the same bowl that contains the sauteed mushrooms, onions, and garlic, add the remaining half of the diced roasted poblano chiles, 2/3 cup cheese, half of the chopped cilantro, and some freshly ground black pepper. Fold in 1 cup of the poblano cream sauce. Taste for salt and add if needed. Spread a small amount of the poblano cream sauce on the bottom of two 9x13 glass baking trays to coat and create a thin bottom layer. Heat up both sides of a corn tortilla on a pan over the stove to make it pliable. Feel free to use a little oil on both sides of the corn tortilla. Add a few Tbsp of the filling along the center and fold both sides to roll the enchilada. Place the enchilada in the tray, seam side down. Continue to repeat with the remaining corn tortillas and filling and place in the tray. For the next step, you can use one of two methods - oven or microwave. If you have the time, use the oven as that is the preferred method of baking. If you are short on time, use a microwave to finish cooking the enchiladas. Both methods will leave you with a tasty satisfying dish. Microwave Option: Cover the enchiladas on both trays with the remainder of the poblano cream sauce, sprinkle with the remaining cheese, and microwave on high for 3-5 minutes until the cheese is melted and the sauce is bubbly. Oven Option: Brush the top layer of each tray with a little oil and place in the oven at 400 degrees for about 10 minutes until crispy and golden. Then evenly cover the enchiladas on both trays with the remainder of the poblano cream sauce. Sprinkle the remaining cheese on top, and bake for an additional 15-20 minutes until golden and bubbly. Garnish with the rest of the chopped cilantro and serve HOT. Sounds so good! I plan on making these soon. Cant wait to taste them! I'm so excited that you tried this recipe and that your dinner party really liked the enchiladas! The recipe seems complicated because of the long instructions, but is in fact very easy to make. 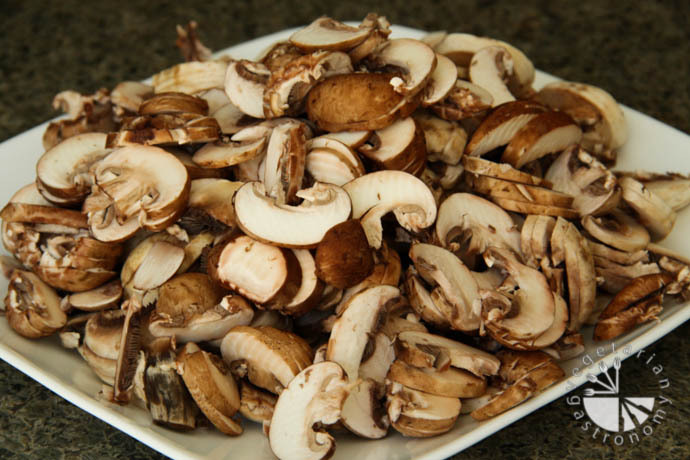 Did you end up using mushrooms as your filling or some other veggie? 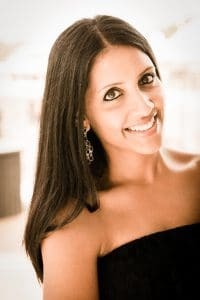 Thanks Anjali for the recipe! I made the enchiladas for 24 people this past weekend. They are foodies and loved the enchiladas. I tripled the recipe and worked it out just fine. The only change I made was eliminating one cup of the broth for the sauce. I would also consider adding some spice besides the chile spice of the poblano (which was very tasty), perhaps some serrano or jalepeno in the vegetable mixture. I made a black bean dish, cilantro rice and roasted some corn (off the cob) as compliments to the enchiladas. Bijul made a rum drink from Nicaragua called The Macua and we had a complete meal. Awesome. Keep them coming! 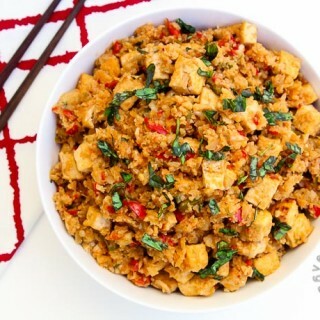 I'm very excited you tried out the recipe and that all your friends loved it! I definitely agree with you on the spice...it doesn't quite come through from the Poblano peppers as you would think. I'll have to try adding fresh jalapenos to the veggie mixture as you suggested. I will also try reducing the amount of broth next time to keep it slightly thicker! Your sides all sound amazing, especially the drink! Thanks for the feedback and suggestions! Hands down the best enchiladas recipe. I will have to try adding some jalapenos or serrano peppers next time to make it spicier like the above post suggests!! Wow great review of the recipe...thanks! Yeah I plan on adding some spice in as well the next time I make these enchiladas! These were fantastic! I missed the part about putting them in the oven for 10 mins with oil before dumping the sauce on-read it right after I poured all the sauce on. lol But they came out wonderful anyways. I didn't change anything, though it did take me about 25 mins to blacken the poblanos. I was really glad you stated how important it was to make the sauce thick before adding the sour cream because that took longer than I thought it would and without that warning I am not sure I would have waited long enough. I will most definitely be taking these to the next potluck/party I go too. This meal pleased a vegetarian, a 12 year old, and a meat lover so it was a definite success! Thanks for the comments and notes! I love these enchiladas and I'm glad all of you enjoyed the dish as well! Thanks for visiting the site! Just tried this recipe yesterday for a small dinner party I hosted. Came out delicious. Only modification I would recommend is adding more spice in addition to the poblano peppers. I also added additional sauce to ensure that they did not turn out dry. The taste of the corn tortillas made this recipe yummy! Oooh..just made the same mistake as someone stated above. Realized the sauce shouldve gone on after removing them from the oven. Oops! Thanks for the comment! Yeah I've found that depending on the poblano peppers, sometimes they end up being spicy and sometimes they are very mild, in which case you're right they need some additional spice. Also, if you've never tried them, try using un-cooked corn tortillas! You can usually find them at any major grocery store! They taste amazing! One of my favorite enchilada recipes...definitely restaurant quality. My husband loves this dish as well! Makes a lot of servings, so we look forward to leftovers throughout the week. 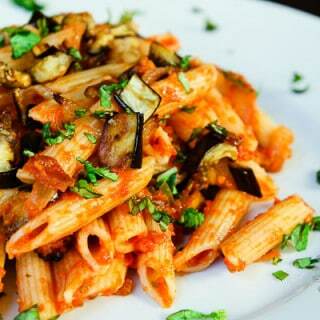 I'm excited that you tried out this recipe...it's one of my absolute favorites! And I tried several different versions before coming to this one...I haven't made it myself in awhile, so now I'm craving it! Thank you again for all the feedback and following my site! !